In my recent article on e-IR, I discussed the concept of agency as a way to view international dilemmas. Using that model, here is a theoretical application of agency as a way to think about future wars. I happen to be sympathetic to Antoine Bousquet's chaoplexic notion of future war. Thus, agency is a way to slice through chaoplexity to determine driving factors of a dilemma. Note, I do not subscribe entirely to the concept of center(s) of gravity (gasp!!!!) because I don't think they exist practically as we want them to cognitively. The arrangement of men into societies is a natural social phenomenon. Aristotle, for instance, argues that the city-state is an arrangement "that exists by nature." Whereas atoms seek other atoms for an equal distribution of energy, men seek other men for a similarly equal distribution of tranquility. Augustine defines the ordered distribution of man's tranquility (human society) as four circles. The first is man's house. The second is the city. The third is the world, and the fourth is heaven. Something or someone guides each circle which also bears the responsibility, as Aristotle contends, to maintain order within the scope of their circle. The ordering of society from household to the world, establishes an ordering of rule. These strata form the environment through which man engages with other men (Figure 1). The rule of man, therefore, seeks to achieve a kind of harmony with what Augustine deems a, "well-ordered concord of civic obedience and civic rule." Agency arises out of man’s ability to rule and express one’s will onto another and is the foundation of violent tensions. Underlying the rule of man is the harmony of good and evil. Socrates and Adeimanstus attempt to prove this as they build a city out of speech to test their model of justice and injustice. From a natural order perspective, the man is an atom with stored potential to act, or agency. As just and unjust men collectively exercise agency, they seek a balance through pursuits of peace in war, and they do so within and across strata. Those pursuits create tensions between existing agency forms. When viewed two-dimensionally, tensions appear as agency forms within quadrants based on their potential to achieve an end and the extent to which they assume responsibility relative to their target audience or targeted objective. One way to think about this definition is by comparing the relationship between responsibility (or blame) and potential for impact. This produces four generalized alternatives as depicted in Figure 2. Along one spectrum is the level of responsibility placed on the actor or medium through which agency takes place. For instance, the Westphalian state retains a high level of responsibility for its actions relative to its citizens and relative to its relationships within the broader international community. Along the other spectrum is the potential that agency form has to achieve an end. End is distinguished as an end rather than the end to differentiate between intended outcomes and the potential to achieve any outcome. Again, the Westphalian state demonstrates high potential to achieve an outcome or end. Hence within the comparative range of responsibility and potential, the Westphalian state, as an entity that produces outcomes, falls within quadrant IV. The central idea behind agency is that, relative to war, any number of entities has a capacity to act either as part of an organized movement or alone; war is generally political, but it can be more than a political aim. Examining dilemmas through the lens of agency expands the international landscape. Agency analysis is an altogether different frame of reference to analyze international and domestic tensions. When examining political relationships through the prism of either political or military theories, one’s understanding is limited to the scope of competing ideas. In a trending chaoplexic environment, the aperture for determining and responding to war should include rather exclude biases. An agency perspective broadens the view offering a more comprehensive picture filled with agency nuances from different and even opposing perspectives. Those nuances are not necessarily competitive, so one is not limited to understanding distributive outcomes – win/lose. Two or more agency nuances may in fact be right despite originating from competing political and military theories. Therefore, agency increases the realm of understanding political tensions generally and analyzing dilemmas specifically. The rightness or wrongness of a situation is not explicitly tied to a particular school of thought. 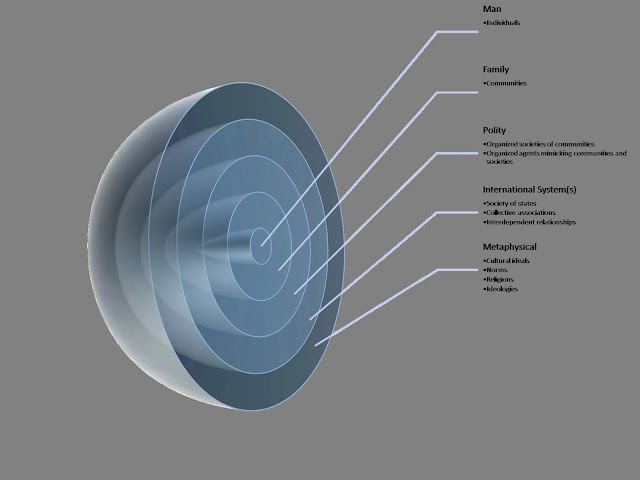 Instead, those schools of thought reveal perspective agency dimensions that represent pieces of a more complete picture. The interaction of agency forms creates tension. Tension begins at the most elemental level of matter and transcends the metaphysical. War is the violent expression of those tensions. Violence in war is a method of substantially increasing the intensity of that tension to break or diffuse the forces that hold the original tensions together. If one thinks of a ball of putty, one imagines pulling the putty apart from two ends. One can pull it quickly at which point the putty becomes brittle and actually breaks apart. Alternatively, one can pull gently at which point the putty becomes malleable and stretches to its limit. These two images represent the breaking and diffusing of tensions that exist between two or more entities. Those tensions agree or disagree. The agreement or disagreement is a force, which is a manifestation of properties that each side holds. Those properties consist of unique characteristics such as geography, ethnicity, culture, language, and religion and they are displayed through collective forms of polity. The ability to create tension originates from a capacity to act or agency. Agency is the determinate influencer to be singled out for exploitation. The emergence of potential war should be viewed through the agency lens to determine a) the potential underlying actors and motives and b) alternatives to challenge those agency forms. Some agency forms may require conventional military options; however, many may require unconventional military options and many more may require non- military options such as publicity or economic measures. Agency, therefore, is multi-dimensional, occurring in various forms within the multitude of planes, across the various strata, and through a multitude of mediums. Osinga notes “Boyd deliberately did not favor one scientific model or discipline over the other, for each discipline could provide insights into the behavior of human organizations in violent conflict, and metaphors for seeing new things in familiar objects.” This agency theory of warfare intentionally absorbs the insights of any number of disciplines to create an entirely different picture of what is occurring when tensions rise. No single discipline provides a basis of input to the agency model; rather, all disciplines and even factors not necessarily associated with a discipline or even yet thought of are accounted for in terms of agency. An agency-based theory of war corresponds to the 2012 Joint Operational Access Concept’s central thesis: the need for cross-domain synergy to complement joint and interagency capabilities to overcome accessibility to enemy threats. Aristotle. Politics. Translated by C.D.C. Reeve. Indianapolis: Hackett Publishing Company, 1998. Augustine. Basic Writings of Saint Augustine. Edited by Whitney J. Oates. Vol. Two. Grand Rapids: Baker Book House, 1948 reprinted 1980. Department of Defense. "Joint Operational Access Concept." Washington, D.C.: Department of Defense, January 17, 2012. Osinga, Frans P.B. Science, Strategy and War: The Strategic Theory of John Boyd. New York: Routledge, 2007. Plato. The Republic. Translated by Allan Bloom. Basic Books, 1991. Augustine discusses the four circles in Book 19, Ch 7 & 9. The environment for conflict consists of Augustinian circles which is comprised of component elements able to affect agency. Augustine, Book 19, Ch. 16. Plato, p. 45. They demonstrate that justice and injustice are natural and rational outcomes of the interactions between men. The interaction of men by its very nature produces just and unjust circumstances which man therefore must deal with. This diagram is meant to portray a conceptual framework for viewing a variety of agency forms. 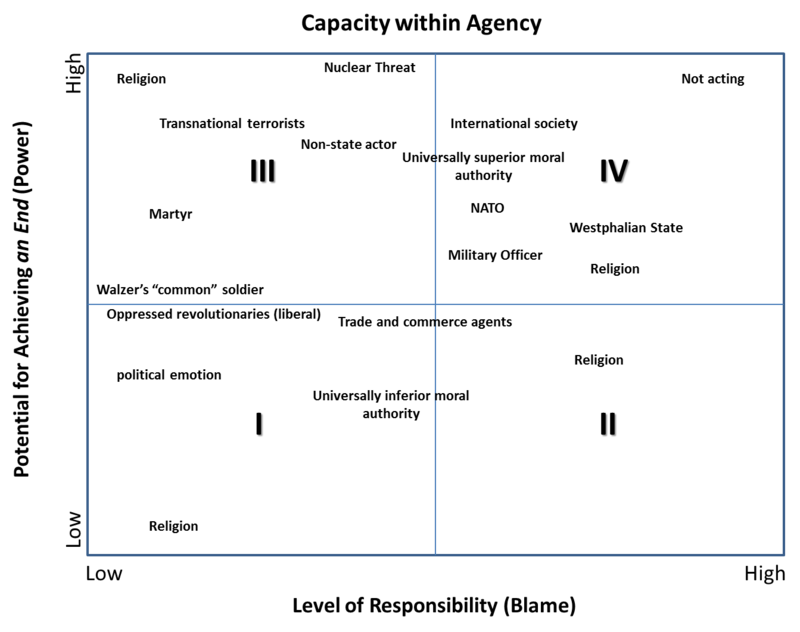 The placement of agency forms in quadrants is based on the author’s initial perception; however, further analytical refinement would need to be done to determine more accurately the relative association of various forms of agency. It is not fully comprehensive as it only contains a handful of agency examples. Generally, political ideas are viewed through theoretical lenses and schools of thought such as realism, liberalism, Marxism, Constructivism, etc. Bousquet, p. 200. He says, “the chaoplexic lens invites an understanding of war in which uncertainty, unpredictability, and change are central.” Furthermore, this author is sympathetic to Bousquet’s suggestion that a new chaoplexic form of warfare is emerging. Joint Operational Access Concept, p. ii.